Immortals proved they would not be shaken, especially not by the bottom-ranked paiN Gaming, while Black Dragons showed us that they’re exactly where they belong. Matchday 11 saw many predictions come to fruition, but also saw an upset between Team Liquid and INTZ e-Sports. LATAM continues to be closely bunched together for those top spots. Immortals and paiN Gaming kicked off the day on Coastline. Unsurprisingly, the pre-stream survey swayed heavily in Immortals’ favor, with the team holding 78 percent of the vote. If we’ve learned anything from the past weeks of play, it is to enter every match with our expectations checked at the door. Daniel Pinto Coelho “Novys” Novy showed paiN that they wouldn’t be pulling any punches by slamming a 4k down on paiN in the first round. Immortals continued their run in round two with Lucca Cezana “MKing” Coser clutching the round with the last two kills and a defuse after retaking the site. 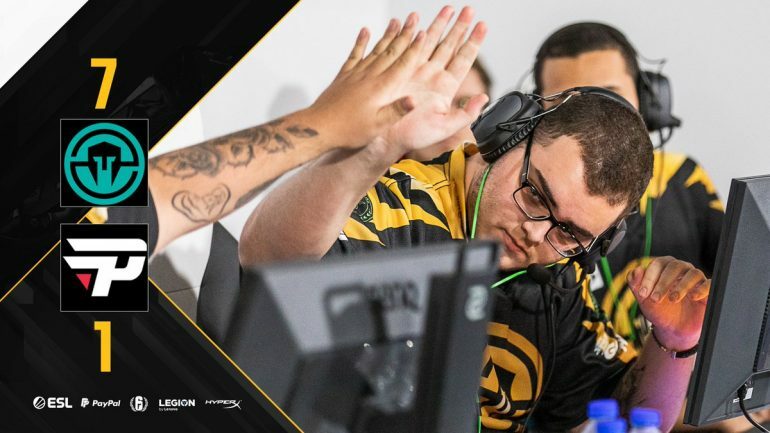 MKing couldn’t come through for his team with another clutch, however, and round three was paiN’s first round win of the match. Matheus Freire “pX” Mesquita managed to cancel any momentum paiN wished to garner by shutting them down in a one-vs-two defuser-deployed situation. Robert “Flynn” Flynn noted that paiN continually failed to clear out the top floor of the site, which is a large reason why the team found only one win in five rounds of play. We saw further evidence of Flynn’s assertion in the from of Novys dropping in from the top floor to deny a Dokkaebi-Zofia push onto site that gave Immortals a 5-1 lead in the match. In a predictable turn of events, Immortals solidified the match at 7-1, and grabbed three more points to keep them at the top of the standings. This puts paiN in dire straits. They continue to sit in the auto-relegation spot at the bottom. Hopefully paiN can secure a win on matchday 12. FaZe Clan matched up with ReD DevilS e-Sports on Villa. The eighth-ranked ReD DevilS came into the match eight points behind FaZe, who sat in the fourth spot and look to stay in the battle for qualification. FaZe snagged 88 percent of the pre-stream vote, leaving ReD DevilS with a paltry eight percent in light of their most recent performances in the league. Going into a match with a single digit percent of a pre-stream survey can’t be a good feeling, and we’re sure that ReD DevilS are more than aware of their current situation. Gabriel “Velvet” Stedile nearly clutched round one for ReD DevilS, but failed to secure the final kill in the one-vs-three situation he found himself in toward the end of the match. FaZe started the round strong with two frags in the first 45 seconds of the match, but ReD DevilS gave them a good run in round one and would continue to prove formidable in round two, even securing a win. Unfortunately, Vinicius Morandi “Vnx” Mello found himself in the dreaded one-vs-five and was the last man to fall against the crushing wave of FaZe in round three. Flynn and Ghassan “Milosh” Finge both agreed that the ReD DevilS’ strategy of running an aggressive defense was an understandable, but flawed approach against a team like FaZe. FaZe continued to capitalize on their one-vs-one gunfights against the ReD DevilS’ defenders throughout round four, which contributed to the growing number of wins the team secured. With the match standing 4-1 in FaZe’s favor, ReD DevilS desperately needed to switch up their strats against the grenade-heavy offense of FaZe. Flynn and Milosh both criticized ReD DevilS’ failure to bring a Jager and also allowing Gabriel Hespanhol Pinheiro “cameram4n” Marcal’s IQ to single-handedly take away all of their utility without any opposition. ReD DevilS’ missteps led them to a match standing at 6-1 going against their favor. The most unforgivable misstep ReD DevilS made was forgetting the defuser in the last-second push made in round seven. Sadly, that round seven misstep cost ReD DevilS the match. FaZe would see a big win with a final match standing of 7-1. With the loss, ReD DevilS have continued their rough run this season. Meanwhile, FaZe will find themselves one step closer to a qualifying spot on the board. INTZ e-Sports fought it out with Team Liquid on Bank, which caused Flynn to let out a heavy sigh. Flynn’s sympathetic sigh towards INTZ further supported another one-sided pre-stream survey. Results heavily favored Liquid for matchday 11, which saw 89 percent of the votes go for Liquid and only seven percent of the vote for INTZ. The outlook was clearly bleak for INTZ heading into the match. Round one went from a slow and cautious start to a last-minute slaughter at the hands of INTZ, who literally let Liquid walk into the site unopposed. INTZ’s capability was showcased when the team retook Lockers site from the attacking Liquid players.Thiago “SexyCake” Reis would not let the round one loss stand. SexyCake pulled an important round two clutch for Liquid, but Liquid would again falter against Vitor “Intact” Janz e Silva’s Smoke hold in round three. A match standing of 2-2 proved that the match would not be as one sided as the pre-stream survey had indicated. Joao “Drunkkzz” Giordani conquered a one-vs-three as Echo to give INTZ a 3-2 lead. With Drunkkzz’s smart use of the Yokai drone to deny plants and waste Liquid’s time, he at least managed to help his team hold 3-3 going into the half. Unfortunately, the official stream lost connection to its LATAM server and round seven went unobserved, and resulted in Liquid losing out once more to INTZ. Liquid somehow allowed INTZ to take away their prospects of a win when INTZ brought the match to 6-4 in their favor. With the win off the table, Liquid looked to secure two rounds in a row to tie the match 6-6. Liquid completely let go of the match, however, and allowed INTZ a match victory of 7-4. With LATAM bunched so close together, this loss puts Liquid in a less than favorable position, to say the least. This was also another huge upset in the current trend of pre-stream surveys being flipped upside down. It’s safe to say it is the upset of the week! @INTZeSports defeats @TeamLiquid! This will drastically shake up the race to Milan! Black Dragons looked to secure a win against Ninjas in Pyjamas. NiP sat just four points above Black Dragons in the standings, and this match served as a do-or-die match for Black Dragons if they wish to even come close to qualifying. Consulate was the battleground of choice with Echo, Nomad, Montagne, and Maestro being banned from the start. NiP saw a roster change when a player by the nickname “muuzi” entered the fold. Both Milosh and Flynn were unaware of the player going into the match. Black Dragons took out newcomer “muuzi” and then cleaned up the remainder of NiP in a swift and effortless round one push. After dropping their first two rounds, NiP did themselves no favors when Gustavo Eugenio “Psycho” Rigal dos Santos impact grenaded himself and his teammate Julio “juilo” Giacomelli at the very beginning of the match. With both Psycho and julio down on health, NiP found themselves in a rough spot as Black Dragons used the situation to propel themselves into a 3-0 lead. NiP finally found a win in round four and managed to slow the train that was Black Dragons in their first three rounds. However, Black Dragons followed the slow first minute of the round with a lightning fast push onto Cafeteria site to secure another win. Black Dragons proved that they are capable as moving as a unit and overwhelming NiP, who had a tough time dealing with the speed of Black Dragons until round six. NiP managed to handle the Black Dragons push well and get their second round in the bag. Unfortunately, Black Dragons did not manage to carry their momentum into the defending side of the match. The match was brought to 6-5, with Black Dragons barely holding on. NiP seemed to build up steam by shutting down their opponents, and at the end of the day, NiP managed to bring the match to a 6-6 draw after completely destroying Black Dragons’ defense. With the draw, Black Dragons would have to be extremely lucky to even have a chance at qualifying. It’s probably not going to happen, but then again, Liquid was supposed to wipe the floor with INTZ, so clearly anything could happen. Matchday 11 wrapped with mixed results. We saw some complete blowouts and some peculiar upsets, especially when it comes to Team Liquid dropping the ball in a massive way. The first two matches of the day being 7-1 matches didn’t quite up the entertainment factor, but at least we learned that FaZe and Immortals are reliable when it comes to predictions. Liquid and Black Dragons were not in their best forms. Both teams lost out on crucial points they would need as a buffer going into the coming weeks. As Milosh pointed out during the broadcast, LATAM will remain anybody’s game until the final matchday. Fans can tune in Friday for the EU division matchday 11 on the official Pro League stream here.